I opened my dishwasher this morning to put the clean dishes away, but I soon realized that the machine did not drain. The same thing happened a couple of months ago and I had to snake out my kitchen sink because it was plugged. The problem was solved. I thought this might be the situation again so I checked out the sink and that was not it. I tried starting the dishwasher again and realized that it was not working at all. So I check the fuse box and sure enough the lever was tripped, I flipped it back and started the dishwasher again. It was working so I started the rest of my day, but suddenly I saw sparks and heard pops happening from under my dishwasher. I immediately ran downstairs to flip the fuse box switch off to cut the power but it was already tripped. I flipped it all the way over to make sure it was off. I am now looking for someone who can come and make the necessary repairs, so my dishwasher will safely work again. Sparks are good, but not all sparks should be allowed to turn into a fire. Those sparks that came from my dishwasher assured me that I needed to cut the path of electricity so a fire did not begin. They were a warning that something was wrong. Then there are sparks that I want to burn in a controlled fire; lighting a candle, wood in my fireplace, a bonfire in the autumn. Stories begin as sparks. Some ‘story sparks’ need to be shut down immediately, it is not a story that should be told or shared. Others need to be allowed to burn but controlled. When you stand before an audience you need to consider the fire your story will spark. Are you trying to light a small candle or start a bonfire? Is the story appropriate for those who are trusting you by sitting in your audience? That’s my thought for this week, now I am going to make some phone calls to try to find someone to fix my dishwasher. Have you ever watched the Great British Baking Show? I like watching it because the competitors are not professionals or celebrities; they are people who just love to bake. They come from all walks of life; teachers, lawyers, ministers, homemakers, project managers. The contestants are a range of ages, male and female, of different nationalities and heritage, and live in a variety of communities. In the show, each participant is given an area in a large tent with everything needed to create delicious baked goods. The stakes are raised with time limits, technical challenges, incomplete recipes, and, of course, the all-important taste test. Sometimes things work out perfectly for the bakers; sometimes, however, it is quite literally a flop. Everyone in the tent is proud of their creations and wants to win. They are competing with one another, yet if a fellow competitor isn't finished and the final seconds are counting down, it's not uncommon for another baker to pitch in to help. It is endearing and encouraging to watch. It's easy to get so caught up in our own "stuff" that we overlook opportunities to help and encourage others. Even though we might be under pressure and stressed, I hope that that we would each be willing to stop and help someone else who needs a hand. No matter the other person's occupation, nationality, heritage, gender, or where they live, I hope we will be kind, remembering we are all on this earth together. 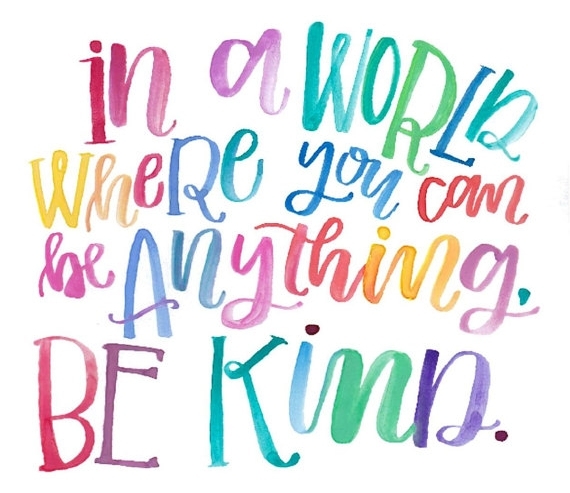 Whether it's through a TV show, an inspiring story from the news, personal example, or all of these — I also hope we will abundantly share examples of kindness with the young ones in our lives so they, too, will learn to be generous and kind to others.